Because every design is unique, the best way to find out exactly what you need for your customized design project is to schedule a time to talk. Just email Jackie Kincaid and let her know that you would like to discuss your custom design needs. She will then contact you to arrange a phone or Skype appointment. "Working with Jackie has been such a blessing!! I certainly am by no means computer savy, but she made everything so easy for me to understand. The finished product exceeded my expectations! I highly recommend Jackie and Tim!" 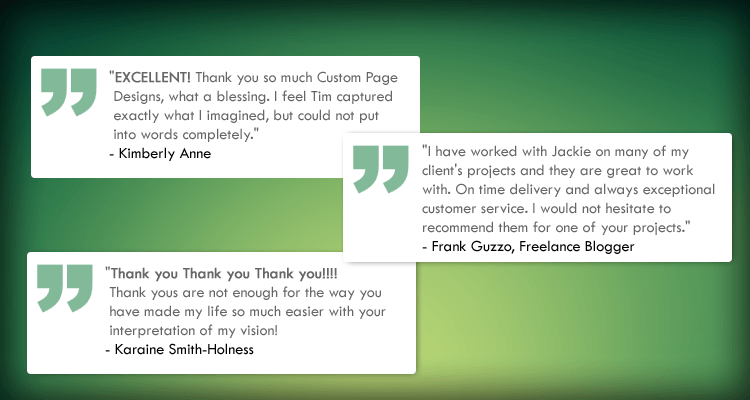 "Jackie and Tim were such a pleasure to work with. Not only did they make the process easy, they did an A+ job in creating a professional product and comfortable learning environment! Jackie is very personable and has a natural talent for creative networking and it is obvious that she enjoys sharing her knowledge. They made the transition into social networking a breeze. I highly recommend Custom Page Designs!"